Trapped in a dungeon while the fate of the Valley is decided by two raging armies, Thorn is haunted by the dangerous and mysterious object of power known as the Crown of Horns. Guarded by dragons, the Crown of Horns is the only thing that can stop the Locust and end the war . . . but how, and at what price? 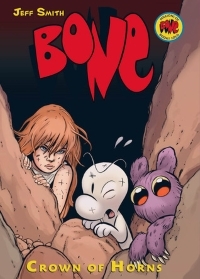 Fone Bone believes he knows the answer, and he must decide where his heart truly lies . . .